For the last three or so years I have been living in a little tropical paradise. Darwin is a city that is not really a city, it still has a laid back vibe not found in other bustling metro areas. I think its the climate that makes it like this, almost every day is 30 degrees so most the time its too hot to hurry anywhere. One of my favourite things about Darwin would have to be the markets. There are markets nearly every night of the week, all with different things going on. We have markets on the beach, in town, in community shopping centres and in the rural area! My favourite would have to be the Rapid Creaak markets. These are located in a community shopping area, with an organic health store (yay)! Every sunday farmers come in with truckloads of every imaginable tropical fruit and vegetable. The markets have a huge Asian influence going on so there is lots of asian food for sale as well. The laksa’s are to die for! Sticky rice parcels, coconut waffles, banana fritters, tofu yoghurt, coconut ice cream and green papaw salad are all a must try too! Every Sinday morning my mother and I explore these markets and come home with bags bursting with fresh fruit and vegetables. They are absolutely bliss and I am going to miss these markets and the produce very much. Anyway, as I am moving this week I have been rather busy packing and not much time for cooking! This cake has been on my mind for a while now as it just embraces the tropical flavours perfectly. If you can’t get your hands on fresh grated coconut flesh, just soak some shredded coconut over night. 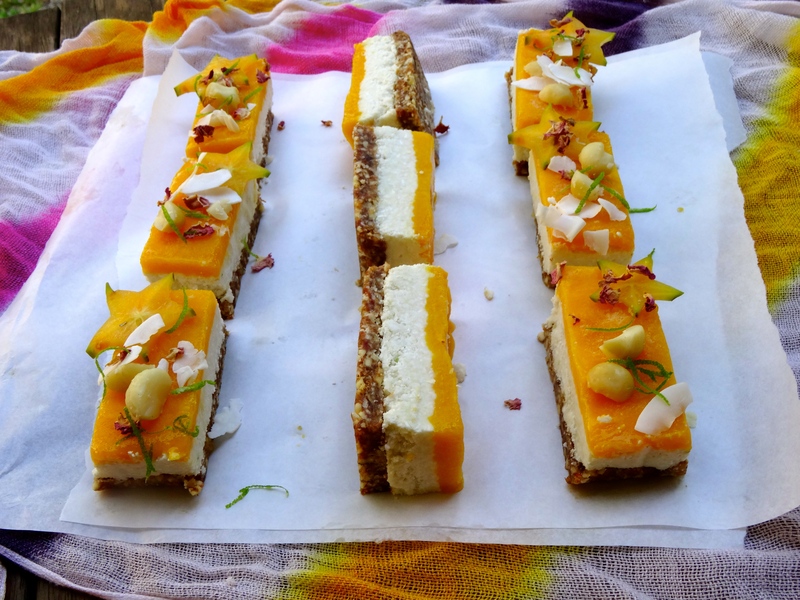 Coconut flakes, fresh fruit, rose petals, lime zest and macadamias to serve. Line a rectangular lamington tin, 30×15 cm, with baking paper. 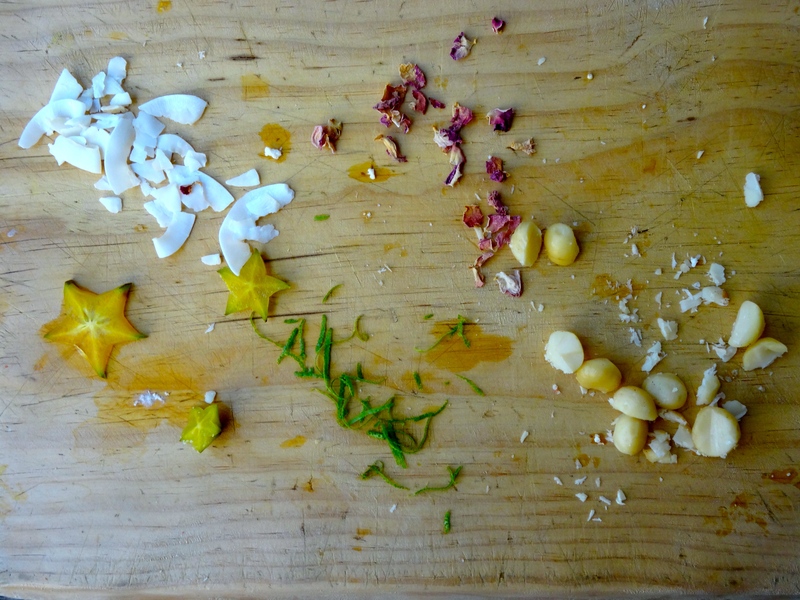 Place the almonds, dates and grated ginger into a food process. Process for 2-3 minutes or until sticking together. You still want a bit of crunch from the nuts in there. Press into the tin and place in the freezer. Place the coconut and lime layer ingredients into the food processer bowl. Process for roughly 5 minutes, depending on the power of your processor. You want a smooth and creamy texture. Pour over the base, smooth the top and return to the freeze. For the final layer, blitz your mango until smooth. Spread over the other layers and smooth the top. Set in the freezer for at least 4 hours. An hour before serving place the cheesecake in the fridge. 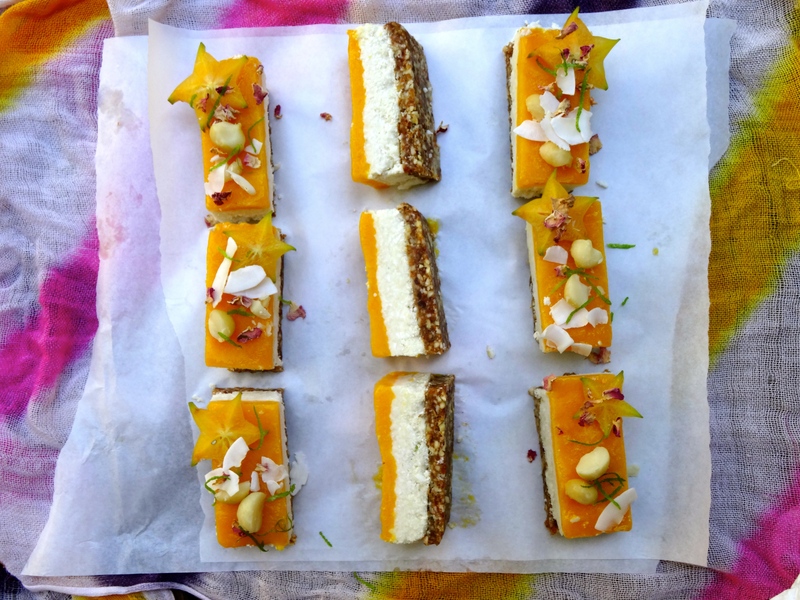 To serve slice into rectangles and top with coconut flakes, fresh fruit and rose petals.